Installing a new hard drive is not difficult, it has become pretty easy because you don’t worry about to set the jumpers on the hard disk drives anymore. The two most common interface cables for modern hard disk drives are IDE and SATA. IDE drives are needed to set jumper to master or slave but SATA drives not. SATA drivers are more cheap and fast than IDE drivers. Also, SATA hard disk drives are most popular today. OK! Let me assume you have just bought a new hard disk drive and it is a SATA drive. This a physical installation for installing a SATA hard drive on your desktop, after having done those steps, you’ll still need to set up hard disk drive on Windows 7, the step-by-step tutorial is there for you too. Shut down the computer and turn off the power. 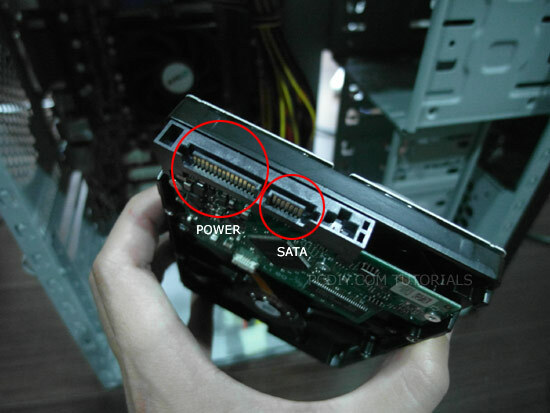 Look at the hard disk drive on your hands, there are two connectors on the hard drive as shown as the figure. The SATA hard drive uses a larger edge connector for power (left), and the small edge connector for data (right). 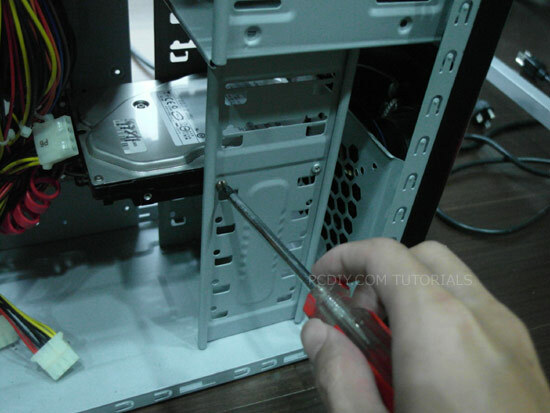 You should be comfortable opening your computer case, locating the SATA adapter on the motherboard, and connecting the SATA cable to the motherboard and hard drive. 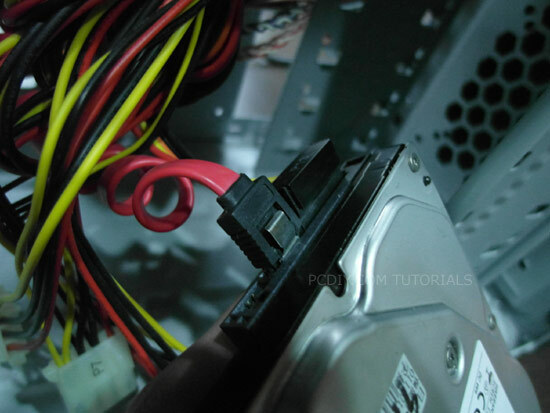 Note: SATA cable is a slender 7-pin cable with a right angle at both ends. 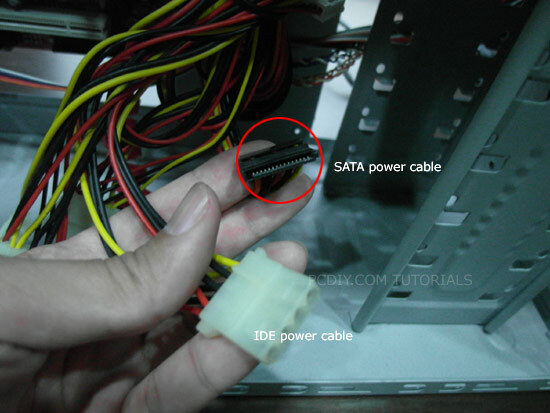 The SATA power cable is a 15-pin cable with a slim wafer design at one end to prevent improper installation, you just connect the SATA power cable (see figure) from the power supply to the power connector on the hard drive. 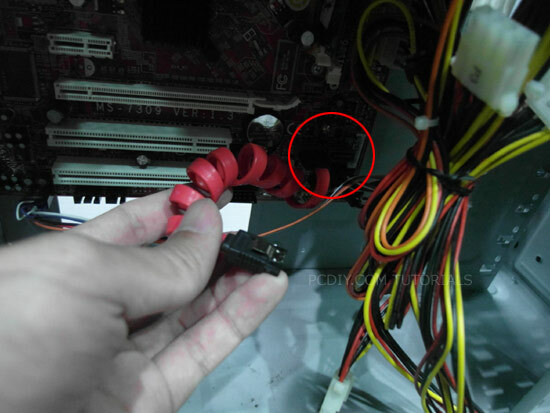 If you have plugged the SATA power cable and SATA cable correctly, it should look like figure below. Install the hard drive into a fixed 3.5-inch drive bay. Close the computer case and turn the power on, BISO will automaticly detect the SATA hard drive if everything’s fine.